A web app that analyzes your emotions through Facebook & Twitter, and can serve as a wake up call for depression. In the modern 21st century, life for most teenagers and adults is getting increasingly stressful. We don't know when someone might fall behind in this rat race and lose ourselves behind. This is why we believed depression is a real psychological issue that needs more attention, and hence we decided to build a web app that would help with that. The web app logs in to your Facebook and Twitter to analyzes yours posts and tweets respectively, and gives you an analysis of your current aggregate emotional state. It provides a suggested course of action if it detects that you are depressed or are on the brink of depression. We used the AlchemyAPI to analyze the text we gathered through the Twitter API and Facebook Graph API to calculate an emotional rating for the user from 0 - 10, with 0 meaning the most negative sentiment and 10 meaning the most positive sentiment. We used this rating to describe the user's emotional state. Using the Facebook API: It was difficult to integrate in to the app and had a high learning curve. We were initially planning on scanning Facebook messages as well, but we realized that is not possible as it is considered an invasion of privacy by Facebook and is not a readily available feature. Implementing a Graph: We wanted to use a graph on our web page to graph the data we collected, but we unable to complete it due to time constraints. The algorithm we had come up with calculation the emotional rating for the user was interesting to come up with. Developing the app in general was a great learning experience. We became more familiar with Flask, a framework for Python Back-End web development. 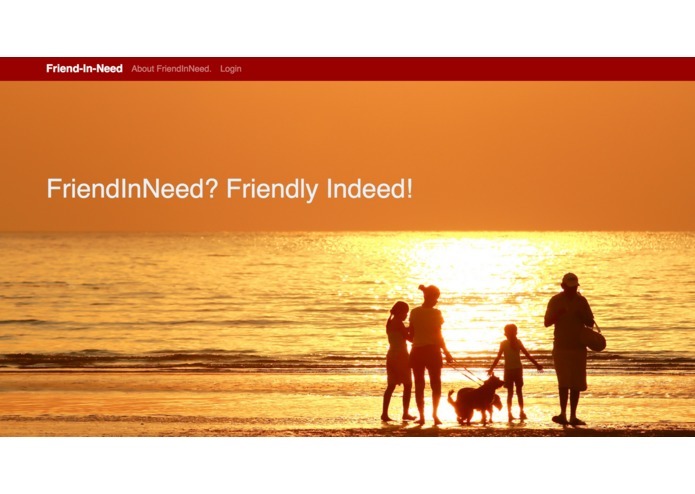 FriendInNeed can be improved further to provide a more detailed analysis for the user. It can also be used to alert selected close friends and family, as selected by the user, if the app ever concludes that the user is depressed and is in need of help.